On the 18thApril 2018, 22 entities active in the field of cultural heritage signed a Declaration calling for the preservation of our built heritage. The Declaration, titled “Our Legacy – Wirtna” presented the fundamental message that the manner in which we treat our heritage is the legacy we leave for future generations. Given the significant role of the political class in upholding the principles outlined in the Declaration, meetings are being held with the political parties. 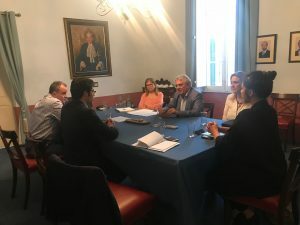 The first such meeting took place on the 31stMay 2018, when representatives of the Kamra tal-Periti, Din l-Art Ħelwa,Flimkien Għal Ambjent Aħjarand The Archaeological Society Malta met with Dr Anthony Buttigieg and Timothy Alden, Leader and Deputy Leader respectively of Partit Demokratiku. Fit-18 ta’ April 2018, 22 entita’ attivi fil-qasam tal-wirt kulturali iffirmaw Dikjarazzjoni li fiha sejħu għall-ħarsien tal-wirt mibni ta’ pajjizna. Id-Dikjarazzjoni, msejħa “Our Legacy – Wirtna” resqet il‑messaġġfundamentali li l-mod kif nittrattaw il-wirt tagħna hu l-wirt li qed inħallu għall‑ġenerazzjonijiet futuri. Peress li l-klassi politika għandha rwol sinifikanti sabiex il-prinċipji tad-Dikjarazzjoni jiġu fis-seħħ, qegħdin isiru laqgħat mal-partiti politiċi. L-ewwel laqgħa saret fil-31 ta’ Mejju 2018, fejn rappreżentanti tal-Kamra tal-Periti, Din l-Art Ħelwa, Flimkien Għal Ambjent Aħjar u The Archaeological Society Maltailtaqgħu ma’Dr Anthony Buttigieg u Timothy Alden, Mexxej u Deputat Mexxej rispettivament tal-Partit Demokratiku. Ġew diskussi numru ta’ materji, inklużil-fatt li kemm l-Awtorita’ ta’ l-Ippjanar kif ukoll l-Awtorita’ ta’ l-Ambjent u r-Riżorsi mhumiex jaħdmu b’mod effettiv, u wkoll in-nuqqas serju ta’ riżorsi li għandha s‑Sovraintendenza tal-Wirt Kulturali u l-liġi dgħajfa li tirregola l-operat tagħha. 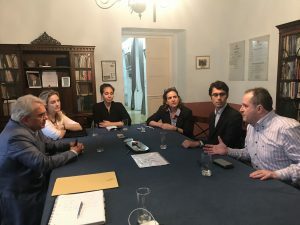 Ir-rappreżentanti tal-Partit Demokratiku kkonfermaw il-qbil tagħhom mad-Dikjarazzjoni u offrew l‑għajnuna tagħhom biex il-prinċipji tad-Dikjarazzjoni jitwasslu fil-Parlament permezz tad-Deputati Dr Marlene Farrugia u Dr Godfrey Farrugia. This entry was posted in DLH News, Featured, Press Releases by dlh. Bookmark the permalink.